First thing this morning, many thanks to everyone who came out to the West End Gallery on Friday night for the opening of my show there. 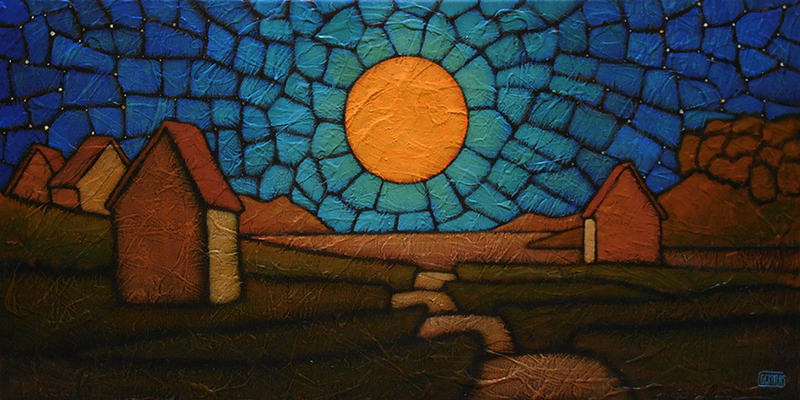 I am most appreciative for anyone who takes the time on a hot Friday summer evening to come into the gallery. It was great seeing old and new friends as well as seeing how they reacted to the work, which was hung beautifully by Lin and Jesse. They did a great job pairing the paintings with original glass work — each seemed to reflect and enhance the other. Again, many thanks for making this a great show. If you haven’t had a chance to get into the West End Gallery, please do try soon. The show hangs until September 2. I will also be giving a Gallery Talk on Saturday, August 6 from 1-2 PM at the gallery. As is now tradition, there will be some sharing so mark the date and try to come on in. This morning is the end of the Tour de France, the incredible bike race that is one of my favorite events of every summer. This last day is generally a ceremonial stage, with the riders coming into Paris en masse for a final end of race for one final sprint to the finish line. The race leader this year is past two-time Tour winner Chris Froome, a Kenyan-born Brit whose skinny frame hides a huge diesel motor within that seems to just chug and chug without end. Froome’s dominance is quite remarkable but just enduring such a race is incredible in itself. Three weeks with only two days of rest that covers about 2100 miles that wind around France and neighboring countries, up and over the highest peaks and mountain passes in the Alps and Pyrenees. It is speed, strength and sheer endurance mixed in with the toughness to scramble up after hitting the road at 45 MPH and continue riding a tough course for another 50 miles. Imagine running half and full marathons nearly every day for three weeks over rugged terrain in all sorts of weather. That’s the Tour. I always hate to see it end. So for this Sunday morning music here’s a French classic, La Vie en Rose, sung by the wondrous Rhiannon Giddens. It is a gorgeous version that she mad in response to the terror attacks in France last year. Unfortunately, it applies this year as well. But be optimistic and have a great Sunday! Well, it’s time for Sunday morning music. I don’t keep up with music as closely as I once did. My mind is occupied in different ways these days and I tend to hold on to music and artists that I know, only stepping outside my comfort zone occasionally to seek something new– at least new for me. Sometimes I just stumble across it. Such is the case with Rhiannon Giddens. I caught a short segment with this musician who hails from Greensboro, North Carolina on last week’s CBS Sunday Morning and was instantly transfixed by the performances they featured. I’ve listened to a number of tracks from her throughout the week and have yet to come across one that didn’t just sail on the strength of her voice. Just a wonderful talent. She is a graduate of the Oberlin Conservatory where she studied opera so you might think she would be singing classical pieces but she works mainly in the field of folk and traditional music, playing both the violin and banjo. But even those two fields can’t contain her. I can’t imagine any genre in which she couldn’t stand out. She does a version of La Vie En Rose in French that is absolutely beautiful and her cover of She’s Got You almost comes up to the level of the epic original from Patsy Cline. I am a little embarrassed that it took me so long to come across Rhiannon Giddens. I guess I should start paying more attention. Who knows what other great talents I have been missing? Here’s a version of the song Waterboy that I think is a tour de force and below it is the CBS Sunday Morning segment that features a little more about her. Great stuff.